We recently got a subscription to Cook’s Illustrated Magazine, and this recipe immediately popped out to us for two reasons. One, we had a lot of leftover egg yolks from making macarons, and two, butterscotch pudding is delicious and this sounded like a great recipe. And oh, it is. This pudding is creamy and full of flavor from making homemade butterscotch (which previously has always ended in burnt sugar for us!). It did take quite a while from start to finish because of all the time it took to make the butterscotch, but the results were more than worth it. If you are looking for an elegant but simple dessert to serve, this is it! It probably would be great with a dollop of freshly whipped cream on top, too! P.S. We actually lightened this recipe quite a bit. The original recipe called for whole milk and heavy cream (in addition to butter and the egg yolks), but we deemed that unnecessary. We ended up using half-and-half and skim milk, and it was still fine. You can certainly make the full-fat version, but we recommend making it as stated below to make it slightly less rich. Bring butter, sugars, water, corn syrup, lemon juice, and salt to a boil in a large saucepan over medium heat, stirring occasionally to dissolve sugar and melt butter. Once mixture reaches a full rolling boil, cook, stirring occasionally, for 5 minutes (until caramel reaches about 240 degrees). Immediately reduce heat to medium-low and gently simmer, stirring frequently, until mixture has darkened, 12-16 minutes (the caramel should be about 300 degrees, and smell very faintly burnt). Remove pan from heat and carefully pour in 1/4 cup cream or half-and-half and stir to incorporate (mixture will steam). Whisk vigorously and scrape corners of the pan until mixture is completely smooth for about 30 seconds. Return pan to medium heat and whisk in remaining cream or half-and-half. Add 2 cups of milk and stir until mixture is smooth, scraping edges of pan to remove and bits of caramel stuck to the sides. Microwave remaining 1/4 cup milk until simmering, about 45 seconds. Whisk egg yolks and cornstarch together in a large bowl until smooth. Gradually whisk in hot milk until smooth and set aside (do not refrigerate). Return saucepan to medium-high heat and bring mixture to a full rolling boil, whisking frequently. Once mixture is boiling rapidly and foaming upwards, pour into the bowl with yolk mixture in 1 motions, not gradually. Whisk for 10-15 seconds (mixture will thicken after a few seconds). Whisk in vanilla and rum. If need be, strain the pudding to remove any lumps. Spray piece of parchment paper with vegetable oil spray and press on the surface of the pudding. Refrigerate until cold and set, about 3 hours. Stir until smooth before serving. Serve in small bowls or cups. Enjoy! Butterscotch Pudding is my favorite flavor. 🙂 I’ve never made it at home though – just enjoyed it when I was little from the box. The half-and-half/skim milk seems to work wonderfully here too. Thanks for sharing this! The pudding is pretty rich on its own, so we definitely thought heavy cream was just added calories! 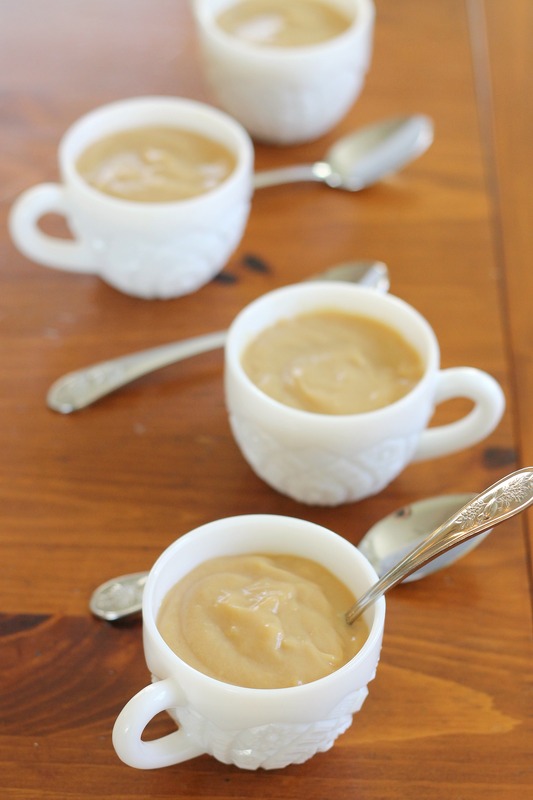 And if butterscotch pudding is your favorite, you will love this pudding because it has a really deep caramel flavor. It’s kind of addictive! Thanks! We thought it needed a little perking up!